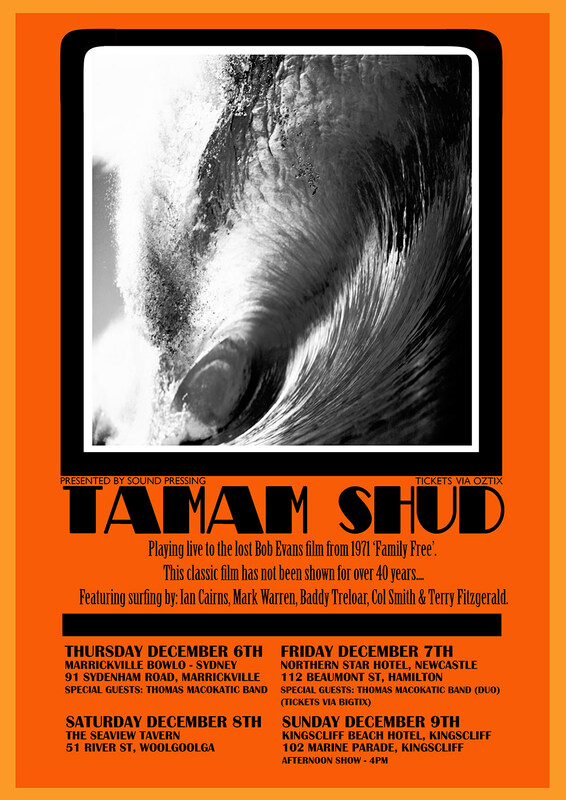 This Thursday, Tamam Shud begin a short tour of the East Coast. Starting at Marrickville then swinging north to Newcastle, Woolgoolga, and Kingscliff, each show will have long lost footage from Bob Evan's last film 'Family Free' playing during the set. 'Family Free' features surfing from Ian Cairns, Mark Warren, Baddy Treloar, Col Smith, and Terry Fitz. Tickets for all gigs via Oztix. I think Bob's last movie was "Drouyn and Friends". I have always wondered why there are hardly any Bob Evan's movies available on DVD? Picture Records 4 Industrial Ave Molendinar Estate Nerang Rd Southport Qld. Recording Studio? Manufacture? Distribution? Printing? Just wondering if this enterprise pioneered quasi Arts/Music Factory precinct.